For anyone trying to get fit, there is an array of fitness equipment to choose from. Weight machines are bulky, dumbbells get scattered around the room, and treadmills turn into clothes hangers. One device is thin and versatile and can provide quite a workout either in a gym or at home – the Theragear ® Body Toning Bar. The Theragear ® Body Toning Bar is ideal for people who want to tone their bodies without adding muscle bulk. As a full body workout, it specifically targets fat and helps a person get in shape without increasing size. The bar’s real perk is its ultimate flexibility. From presses, rows and curls to dead-lifts and leg lifts, you can work it into just about everything. Many exercises that can be done with a barbell can be used with a body toning bar, such as shoulder presses, squats, and lunges. One advantage of using the Theragear ® Body Toning Bar instead of a barbell is that its weight is evenly distributed along its entire length, while the barbell's weight is at its ends. Therefore, beginners often find body toning bars to be more appealing to use and easier to learn than barbells. You can also use a body toning bar to perform swings, swipes, and various rotation movements that are similar to martial art staff fighting. 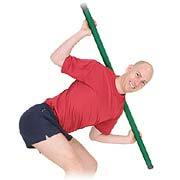 For example, hold the bar with both hands in an overhand grip and raise your right shoulder and arm up. Step forward with your right leg, and strike the bar down and diagonally in front of you. Turn your body slightly to your left as you do so. Step back to start position and do the same movement with your left side. The body toning bar is the ideal free weight for women. Many people say so. I’m not sure if it’s because the body toning bar works better with the body contour or because it better suits women goals. Most women want long, lean legs, which is where the body toning bar comes in handy. Adding resistance with the body toning bar lets you build and define the leg muscles without adding the bulk that often comes from using your full body weight (i.e., squats and lunges). If you’re a beginner, you can use the bar for balance while performing standing inner and outer leg lifts—or get the full resistance with a floor leg lift. The inner thigh lift with bar is great for toning the impossibly-stubborn inner thigh area. The bar is easy to control from this angle once you get the hang of it. Add resistance by extending the bar further off your leg.